Lately, Nesting in my third trimester had me enamored with all things organized. 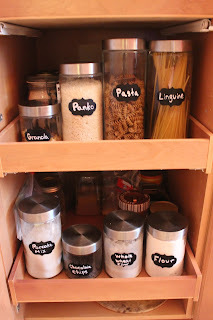 I would stay up at night thinking of things I could label and put in bins. I would whine to my hubs about why we didn't have a Container Store within a 100 mile radius (because I was willing to drive that far). So when I came across these chalkboard labels my heart skipped a beat. I ordered them immediately and my heart was content knowing I was one step closer to my organized madness. Instantly my pantry was transformed into food art. Isn't she a beauty? Check out Braden's Grace on Etsy to begin your labeling mania. Your pantry will thank you!